Josh is a Policy Fellow in the Grantham Research Institute on Climate Change and the Environment where he leads the policy analysis team on UK climate & energy policy. 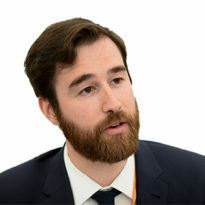 Prior to joining the Grantham Institute, Josh was a Senior Research Fellow at Policy Exchange where he led the Energy and Environment department. He was responsible fordesigning, leading and delivering existing and new research projects focused on energy and environmental policies which respond to the most important questions the UK faces, as well as writing articles, organising events, and talking to policymakers, experts and opinion formers from government, academia, NGOs, Parliament and business. Before this he worked as a Project Manager in an AiM listed renewable energy project developer focussing on distributed generation. His professional experience also includes work in the public policy sphere at both Chatham House and The Overseas Development Institute. He has a BSc in Geography from the University of Nottingham , an MSc in Environmental Technology from Imperial College London. Design of economy-wide economic policy framework for decarbonisation. What does the October 2018 Budget mean for UK carbon pricing in a no-deal Brexit?